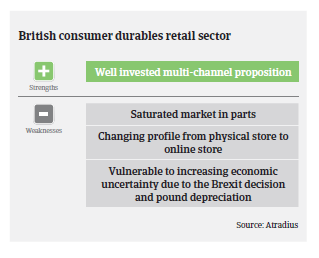 The UK sales outlook for consumer durables in 2019 is more subdued as household finances are strained and private consumption growth is decreasing. Last year the British consumer durables sector was impacted by increased economic uncertainty, lower GDP growth and decreased consumer confidence, leading to tougher trading conditions and a downgrade of the business performance/credit risk situation of the industry from “Fair” to “Poor” in December 2018. Since then, the situation has not improved at all. According to the British Retail Consortium footfall during the 2018 holiday season decreased 2.5% year-on-year (after declining 3.5% in 2017), and sales remained stagnant – the first time since 2008 that there was no annual growth. 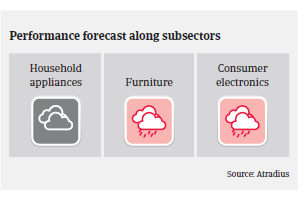 The sales outlook for consumer durables in 2019 is subdued, as consumer sentiment remains low, household finances are strained and private consumption growth is decreasing. Uncertainty over the Brexit outcome additionally hampers consumer spending and business investment. The economic growth outlook for the UK has worsened since Q4 of 2018 and remains highly uncertain. While the sales performance of household appliances has shown some resilience so far, furniture retail has been impacted by lower demand and higher input prices due to the weaker pound sterling, as furniture heavily relies on raw material imports. In the consumer electronics segment, low levels of innovation and longer product life cycles have led to difficult market conditions. Changes in consumer buying patterns (e.g. in the mobile phone segment away from ‘bundles’ towards sim free/sim only) mean that retailers need to adapt their offering. The textile/footwear segment has been impacted by unseasonal weather conditions, poor buying patterns and increased import costs, as clothing is heavily reliant on overseas manufacturers in Asia and Europe). Given the more difficult trading conditions it comes as no surprise that profit margins of consumer durables retailers deteriorated in 2018. Further decline is expected in 2019, mainly for brick-and-mortar retailers. The portfolio payment experience has been bad over the past two years, and we expect non-payment notifications to increase again in 2019. According to Ernst & Young, retailers reported a 50% increase in profit warnings in 2018 due to margin pressures, the need for reinvention and lower consumer confidence. The clothing segment is mainly affected. Retail insolvencies increased in 2018, with about 2,600 shops and stores affected, compared to 1,400 in 2017. The number of business failures of large retailers also rose, especially in the textiles/footwear segment. A growing share of businesses, including multi-store retailers, has entered ‘Company Voluntary Arrangement’, trying to reduce their debt and/or rent burden with this insolvency procedure. In 2019 retail insolvencies are expected to increase by more than 5%. The industry is going through a period of correction, with businesses failing to adapt to online demand facing serious troubles. 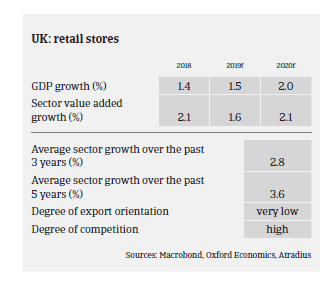 Lower sales and postponement of investment decisions have large ramifications for both larger and smaller retailers. 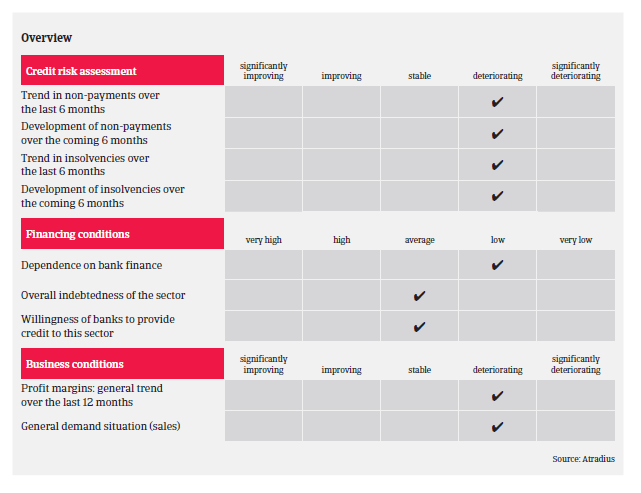 We currently maintain a restrictive underwriting approach in the consumer durables industry. Our underwriting stance for household appliances remains neutral for the time being, but a deterioration in the short-term future cannot be ruled out. We are restrictive with buyers in the furniture and consumer electronics segments, and even very restrictive with clothing/footwear retailers due to sharply increased numbers of business failures, including insolvencies of larger businesses. We continue to monitor developments in the sector on a regular basis, making as much contact with buyers as possible (meetings, conference calls, and management accounts). This enables us to track progress and underwrite appropriately on a case-by-case basis. In particular, we focus on businesses that rely heavily on sourcing materials from overseas, those who have large store portfolios, high levels of debt to service and those whose financials are showing signs of deterioration. The UK leaving the EU without a deal would be a major disruption, causing business insolvencies to be higher in the UK and EU27. After a minor increase from 2016 to 2017, the proportion of past due B2B receivables in Western Europe increased again this year and stands at 41.8%. Some larger players continue to push the supply chain on price and longer payment terms, adding cash flow challenges to mainly smaller food businesses. Информация о компании Atradius N.V.
Вся представленная на сайте информация выложена исключительно для ознакомления и не должна быть использована в каких-либо иных целях. Действующие юридические условия обозначены в соответствующем Договоре страхования. Ничто здесь не может быть истолковано, как создающее права, обязательства или ответственность со стороны компании Атрадиус, включая обязанность работать с должной осмотрительностью с определенными Контрагентами или с Вами. Если Атрадиус предписывает работать с должной осмотрительностью с каким-либо Контрагентом, то это делается в целях андеррайтинга нашей компании, а не для выгоды Страхователей или других лиц. Кроме того, ни в коем случае Atradius и связанные с ним, дочерние и аффилированные компании не несут ответственности за любые прямые, косвенные, специальные, случайные или побочные убытки, которые могут возникнуть вследствие использования информации, представленной в данном документе.